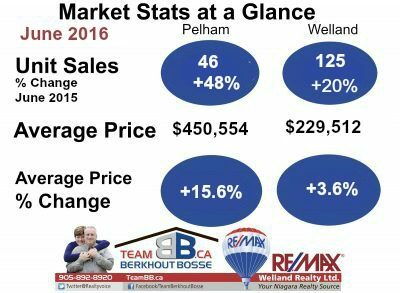 During the first six months of 2016 there were 212 unit sales recorded in Pelham – up 45.2% from the total of 147 transactions reported between January and June 2015. Our local 12 month average price now stands at $450,554 up 15.6% from last June’s month end figure of $389,687. 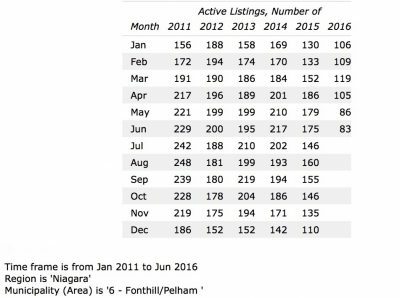 As of the end of June 2016 there were 83 active listings in Pelham on the MLS® system of the Niagara Association of REALTORS®. A significant drop from the June 2011 total of 229 homes for sale. Demand continues to escalate while our inventory of available listings remains at record level lows. Multiple offers are now a regular occurrence in our local marketplace with many homes now selling over asking price. Now more than ever it makes sense to retain the services of a professional Realtor to manage this selling process for you. Thinking of selling? Call us for a marketing consultation – you may be pleasantly surprised what your home will fetch in the current market conditions.